Don’t you think there are too many blogs around? Gave it a try, and I kind of liked it. In just a few minutes I was able to create my own 360 page. Creating blogs was easy and I did that in just a few minutes. Again, the drag and drop feature for the images were really nifty! I was very pleased to see that Yahoo supported Firefox, my choice browser over Internet Explorer. However, the one thing that flawed it a little was that it wasn’t really customizable. I can’t change the background to green. There is no templates for it at all. Pity. 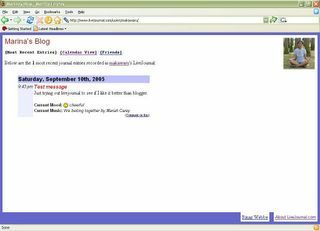 MSN Messenger, the other IM program that I use also had MSN Spaces, which has been around for a while. Easy to use, and very user friendly, it allowed users to drag and drop in photos using their own software and I liked the part that one is able to move the boxes around. I thought it was nifty. * Problematic even with Internet Explorer. Everyone is getting into blogging. Even schools are promoting blogs. 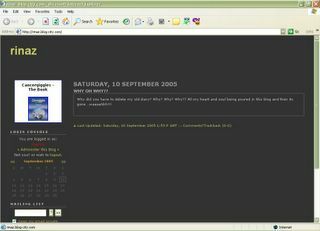 Got to know about this website while participating in the Inter schools moblog competition 2005 It was quite a standard moblog, not much customization except for maybe colours and such. It allowed photos from mobile phones and what I liked about it was that people HAD to register to the blog using their phone accounts to prevent spamming. It made it a more safe environment for kids. It was not a bad blog. In fact, it had many friendly people in there that would take the time to say hi though the chat box. But personally it was a little too bleh for me. I think it could be better, if it was easier to use instead of having so many different pop up windows opened. I could imagine that the kids who aren’t used to blogging, would have complications trying to understand how to make it work. I was surfing through my favourite forums where there was a link that needed my registration to livejournal. Gave it a try. It definitely isn’t for me. It was not so easy to use. And I am sure that it is not customizable, I don’t see anywhere I could just point and click. Urg. I do like the fact that users could categorize their posts. Like this post could be filed under the topic “tech” and the post below under “daily life”. Plus there is a mood indicator, which is amusing. Ahh … Le Originale bloggarrific. Brings back memories as I tried to use it again. 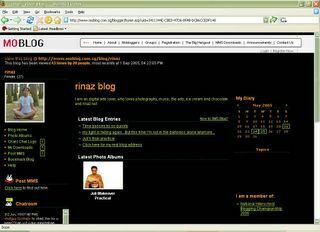 Rinaz bloggariffic will still be there if it weren’t for the fact that it was deleted because I forgot my password after a couple of months. I still wonder what the previous posts that I wrote were. Anyways, again, a straight forward blog, the only customization that you can do, is the colour change. 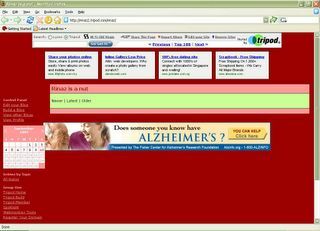 I used to host my webpage with tripod for a while. Then it started its advertisment. Which was fine with me. And then it had TWO advertisments. Still fine. And then it had a pop up on top of the two advertisment which really got to me. Call me biased, but I don’t fancy their blog . Yuk. I still prefer blogger. It’s straightforward, allows you customization and still relatively easy to use. However it would be nice if there were more done for those people who aren’t very familiar with css and other net jargon. I’d like to do a customized page with my own banner and background. But I don’t even know where to start. Yahoo 360 is a strong contender for the moment. Lets see how it goes. i agree with you gurl..there is too many blog out there..well anyway just choose the best one to blog around then..hehe! 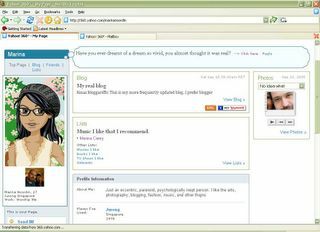 Being an online blogger who keeps public, only for friends’ eyes and private entries, I feel that Livejournal is still The One despite it being restrictive to only HTML for customising. Multiply has the discretion function too but alas, its templates are limited and stiff for users to personalise. To add a little thrill and excitement, fortunately OR unfortunately for you, one of your cousins has been quietly reading your blog for ages. Me!! Let’s see if YOU can find ME. Wahahaha! If you’ve guessed who I am, lemme tell you first, NOPE THAT’S NOT ME! Bwahaha! He or she, old or young, single or married, fat or thin, tall or short, fair or dark, maternal or paternal.. Good luck! 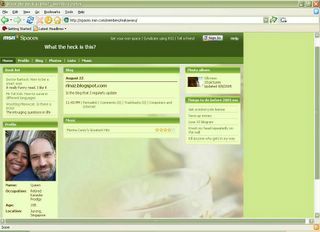 I tried out Blogsome but it’s not as user-friendly as i thought. Yahoo 360? Ooh…looks cool. Hey i’ve seen gorgeous blog templates that were just modified from the good ol’ plain Blogger default templates.. (I view their source code haha) So you can try playing around with that.. Very blur. Blogger doesnt have a dictionary for this, I think. Ah, in time I’ll figure it out somehow. Tet!! Wrong! Nice try. Wahaha! Siapa seyy … The only cousin I sent an email recently is Fuzzy. Oh well.